With regard to a new way of working there is one topic which many employees wish to change. It is the topic of stress and burnout. It cannot be denied that stress at work is part of daily life in modern performance society and that the burnout rate increases undampedly. The office for job strategy in Berlin (www.berufsstrategie.de) has brought it to the point in one of their articles: In modern working life the individual requirements increased considerably. However, oftentimes a factual overload is not picked out as a central theme for worries regarding the reputation or the working place. In addition, it is mainly the people who are very much willing to work who are overstressed and who tend to not admit this overload due to too much sense of responsibility. Parallel to the increasing work load during the last years, the number of employees, who perceive clear burnout symptoms, has been rising massively. According to a recent survey of the market research institute EMNID every fourth employee in Germany is currently in a situation that panders to burnout. Factors that support stress and burnout are for example a high degree of responsibility, increasing workload, the constant requirement of more performance and oftentimes also conflict situations between people. Common symptoms of burnout include, but are not limited to, feeling drained of physical and emotional energy, a feeling of achieving less than one should, or a feeling of not getting what one wants out of one’s work. In the scope of the New Work movement that puts the human being back into focus, chances are like that a new approach can be applied that does not only reduce stress and burnout but actually prevent it. But what are essential components to prevent stress and burnout? It has a lot to do with human skills that have been forgotten and actually been unlearned in daily bureaucratic business life in order to survive in the hierarchical competition fight. Let’s take a look at the first of these important aspects to avoid stress and burnout. What does center and being centered specifically mean? Consider that you have two kinds of centers: The physical center and the so called being center. The physical center lies between your hip bones in the middle of your body and is responsible for your physical balance. Its location cannot be changed. In addition to that you also have a being center which is movable and starts off in the size of a grapefruit. In daily business life people tend to put their being center in their head, i. e. they think, analyze, discuss and calculate all day long. Many people also give their being center – and thus their personal power and authority – to another person (e. g. the boss, the colleagues, the demanding customer, etc.). This usually happens unconsciously. A person who gives their being center away often tries to please others, meet others’ expectations and behaves adaptive. This gives the apparent impression of security, because the other person cannot do anything to you and might even take over more responsibility or make the final decision. What happens, however, is the fact that you lose your personal power. 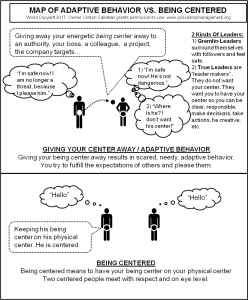 Each time you give away your center you behave adaptive and cause an inevitable interdependency. Be aware that nobody can take your center away. Other people can make offers and invite you to give them your center (e. g. the boss the puts pressure on you, the nice colleague that is flirting with you, etc.). Yet in the end only you can give your being center away. Therefore it is important to become conscious about your own being center and what you are doing with it. To step out of the stress-burnout-spiral it is necessary to learn to stay centered. How does this work? You first of all use your attention to locate your being center (probably it is in your head). Then you use your intention to put your movable being center onto your physical center. As soon as your being center is in the same place as your physical center, then you are centered. When you own and stand in your own center – and thus are your own, powerful authority – you reach a state of relaxed receptiveness and balance in which our attention is no longer focused on meeting expectations. When you are centered, you can take a stand for yourself and can no longer be manipulated. True leaders empower their employees to have their centers. Here is a reference point for a centered position: there are some kinds of sport like e. g. fencing, karate, taekwondo, ballet, capoeira, etc. that have specific centered starting positions. These starting positions are completely centered and grounded (oftentimes with slightly bend knees). That means that these starting positions are so stable that you cannot push the person out of their balance, while at the same time the person is able to move from this starting position into every direction. By the way, you cannot only give your being center away to another person, but also to other things, e. g. a project, time, the extra bonus, your job targets, etc. As soon as you have learned to be centered (it takes some training to get there) you are able to minimize your NOW. This means that you are fully present and awake in every single moment. Now… and now… and now… You are neither with your thoughts in the past nor in the future, but just in the here and now. Many people shown stress and burnout symptoms live in a very big NOW. They think for example in this second already about the 120 tasks, emails and appointments they have to deal with tomorrow, next week or next month. If you think in this very moment already about tomorrow and are afraid of the upcoming workload then you give away your center to the future and can no longer use your power to deal with what’s relevant right NOW. The same happens when you still think in this very moment about last week and thus give your center away to the past. Just imagine a tennis match. The players have to be centered in the very moment to be in their full power and concentrate only on the next ball. If they gave their center to the last game or to their next holiday they would no longer be able to be present in the match. In daily business life it is quite usual to have many appointments and tasks in mind that are up in the coming 2 to 3 weeks. However, the thing is this: Your energy follows your attention. If you put your attention for example on customer appointments which are not yet there, or you repeat discussions in your mind from the past over and over again then you are lacking this energy in this very moment and cannot act in an awake and present state of being. Instead, center yourself (using your intention) and ask the question „What’s up NOW?“ Then you handle the task without even glimpsing at your long to-do list once. When you are centered in the NOW and are thus your own authority, an interesting question could arise: „Who has a problem?” Apart from the fact that people who tend to be stressed and fall into burnout oftentimes think they have to handle to many things at once, another aspect is that they try in addition to solve the problems of others. Also in this case they give their centers to the other people. If you have a problem, get it that it is your problem. You having a problem is not a problem for anybody else. Take responsibility for having created the problem as a custom designed learning environment for yourself. Dealing with problems is how we learn what we need to learn. You can do with your problem whatever you want. You can solve the problem, talk about it, embellish it, keep it, etc. It is your responsibility. If someone else has a problem it does not mean that you have a problem. Let them have their own problem (even if it is your boss). This person worked hard for their problem. They created their problem. There is nothing left to do for you. Oftentimes we do not make this distinction and make other people’s problems our problem (especially when the other person is an authority). Let them work it out for themselves and go through dealing with boundaries or other difficulties without being able to use whining, shunning, name-calling, or tantrums to manipulate you into deciding differently. A responsible way to deal with problems of others is to listen to them. Once you extract yourself from imagining that you are responsible for someone else’s problems you suddenly have all that energy back to use for other things. Being clear about whose problem it is opens up the possibility of discovering an interesting new territory where you are alive and in relationship and there is no problem. In case you thought the third option is „We have a problem“, just ask yourself the following question: When you are in a meeting and somebody says „All right, then we have to solve it!“ – who will actually do it? Right, nobody will do it, because there is no WE when it comes to responsibility. Several people could have the same problem, but only each single person can take their part of the responsibility to solve the problem. The third essential aspect to get out of the stress-burnout spiral might be the most challenging one, because it addresses a taboo topic in business life: Feelings. The attitude of modern society with regard to feelings is based on the assumption that feelings are not okay – in general and specifically not at work. Those who show feelings at work are said to be weak, unprofessional and not resilient. In total there are four big feelings territories that can be distinguished: Anger, sadness, fear and joy. 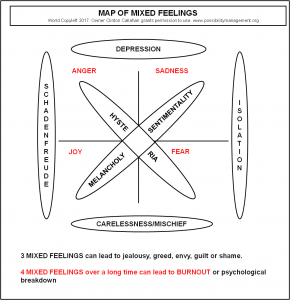 There are other terms for feelings, but they usually either belong to one of the four territories (e. g. nervousnessbelongs to the territory of fear, while resentment belongs to the territory of anger) or are a mixture of feelings. Specifically anger is said to be irrational, destructive, uncivilized, dangerous and unprofessional. Sadness is – according to the general opinion – weak, emotional, drags others down and is also unprofessional, while fear is considered to be cowardly, instable, paralyzing, incompetent and nerve-racking. Joy on the other hand is okay to a certain degree. Yet when you show too much joy you are unrealistic, childish, silly, naive and don’t take life and work seriously. To unmix feelings, it is necessary to first of all make a new assumption about feelings. The new assumption – which most of us did not learn – is: Feelings are neutral energy and information that serve you. They are not a design error of the universe. You need for example your anger to set clear boundaries, make decisions, say yes/no, discover injustice, take action and go the next step. Sadness is a great feeling you need for sharing authentically, being vulnerable, letting go of things, developing compassion and giving space to others. Fear serves you in the way that with fear you can recognize danger, evaluate risks, be present and attentive, stay in nothingness and try new things. With joy on the other hand you can be enthusiastic, inspire others, experiment, follow you vision and go forward. As soon as you learn to separate the feelings and express them consciously and clearly in a safe space, you get access to the energy and information that is behind and this actually brings you back into life. Another step out of the stress-burnout-spiral is that you take over greater self-responsibility. That means that you step out of the victim mode with regard to the circumstances. As soon as you take responsibility you cannot be a victim anymore. Greater self-responsibility has something to do with an inner attitude. It is about confessing which kind of benefit you got from stress and burnout and how you arranged it to get into that situation. Greater self-responsibility seems to be unfair, because it doesn’t allow any loopholes. Yet it is not about putting all the guilt of a situation on your shoulders, but you stop complaining about the situation. You rather stop complaining about the situation and become the creator of your life. 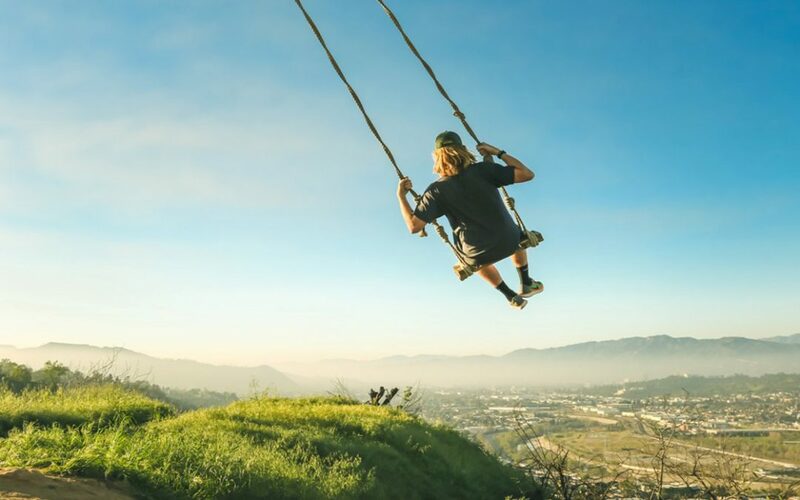 When you are centered, present in the now and have learned to own your feelings power again, then greater self-responsibility leads to you taking a stand for yourself, setting boundaries, bringing about change, consciously taking breaks and holidays, paying attention to the signals of your body and getting back to the essential things in life. As bitter as it is, one thing is clear: more and more work, performance pressure and therefore connected stress through mixed feelings landed in your life, because you allowed it and didn’t know of any other possibility. Now you have new possibilities. There are many more aspects regarding this topic. They would however go beyond the scope of this article. In addition, the four essential components to get out of the stress-burnout-spiral are not skill you quickly grab with your mind and apply them immediately in your daily life. It is rather a process that requires a certain training. Yet, when you take on this path you will be surprised in which short period of time you can not only get out of the spiral, but how much more life energy and inspiration will spread again in your life. You will have the possibility to play a completely new game, far away from performance pressure and stress. In the New Work movement humanness is important again. Are you willing to play a new game?